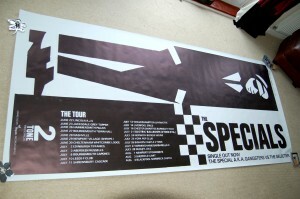 Someone asked about The Specials Album quad poster and have re-produced it on a matt poster paper for him. Really delighted how this has reproduced. Took a bit of work and retouching and not looking like those cheap scan jobs on eBay. So this Teflon poster design rides again and available now directly from me or soon online www.2toneposters.co.uk… and signed . 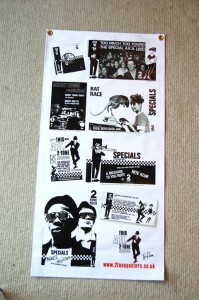 Currently on eBay there are a few days left with a unique opportunity to bid and buy a bit of 2 Tone History by designer John Sims aka Teflon and his involvement with the black and white rude boy design work of 2 Tone, The Specials, The Selecter, Madness, Bodysnatchers, Dance Craze plus some hand written memorabilia etc. There are 4 history banners plus the Nutty dancer available. These are a 1 metre x half a metre PVC hemmed limited edition digital print and signed by the designer. 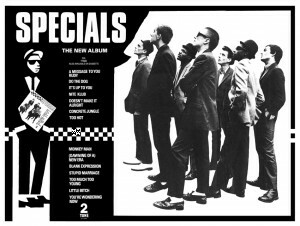 Part of the This Art 2 Tone exhibition displays (www2toneposters.co.uk) but at the smaller size print. They have small brass eyelet at each top corner for wall hanging. Bid and buy… once they gone they are gone. You are currently browsing the classic 2-tone graphics news archives for September, 2011.